By having the row of steel plates positioned within the gas flow of a steel tube, it allows the exhaust gases to heat up the plates to 600-800°C (1100-1500°F). 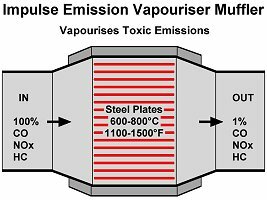 This produces such a high temperature inside the Impulse EV muffler it effectively vapourises the toxic emissions as they pass between the plates. As a result it reduces the toxic emissions to near ZERO. However, to achieve this high temperature the row of plates have a specific thickness, spacing and length. If the thickness, spacing or length of the plates is increased or reduced from optimum it substantially reduces the temperature of the plates and their effectiveness to vapourise toxic emissions. This also happens if a larger EV muffler is used in a smaller size exhaust system. 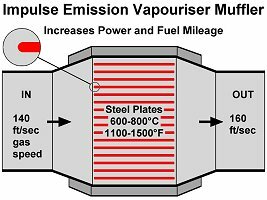 Therefore, 1) the row of steel plates in the Impulse EV muffler require a specific thickness, spacing and length and 2) the EV muffler needs to be the same size as the exhaust system to achieve the high temperature needed to effectively vapourise toxic emissions. By having the row of steel plates positioned inline with the gas flow and a radius at the end of the plates, it allows the gases to flow freely and unrestricted through the Impulse EV muffler. 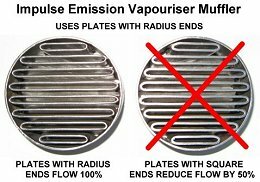 The plates of the Impulse EV muffler have radius ends to allow the gases to flow along the surface of the plates which produces 100% gas flow through the muffler. Whereas plates with square ends force the gases to flow away from the surface of the plates which reduces gas flow by 50% and needs a much larger muffler. Therefore, as the exhaust gases heat up the plates the free flow design allows the higher temperature of the plates to increase the speed of the gas which produces more vacuum. As a result the higher vacuum helps pull the exhaust gases out of the cylinder which improves the efficiency of the engine and increases power and fuel mileage by 3-5%. By having the row of steel plates positioned close together it also reduces the amplitude of the sound waves produced by combustion. As a result this reduces exhaust noise by 5dB or 36% using 1 EV muffler. This is the same reduction in noise produced by a typical reverse flow or tri-flow muffler with a large housing. However, the Impulse EV muffler is much smaller like a hot dog or cherry bomb muffler and can be fitted to any part of the exhaust system. 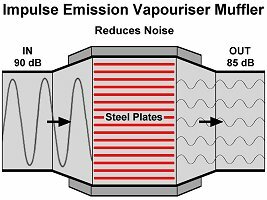 Therefore, by using 1-4 EV mufflers in a single exhaust system the noise may be reduced by 5-20dB or 36-144%. This allows using a noisy straight through performance muffler in conjunction with 1 or several Impulse EV mufflers to further increase power and fuel mileage while reducing noise to the same level as standard restrictive mufflers or to any level desired. By having the row of steel plates positioned within the gas flow of a steel tube, it also allows the exhaust gases to heat up the plates almost immediately to 600-800°C (1100-1500°F) from a cold start.